Den Holder manufactures and supplies Flange Insulation Sets which include gaskets (type F, E or D), sleeves and washers. The most common style of gaskets is Type ‘F”, where the gasket is designed to fit in between the Boltholes, Type ‘E’ which is designed with a full-face gasket or Type ‘D’ where the gasket is Ring Type Joint. 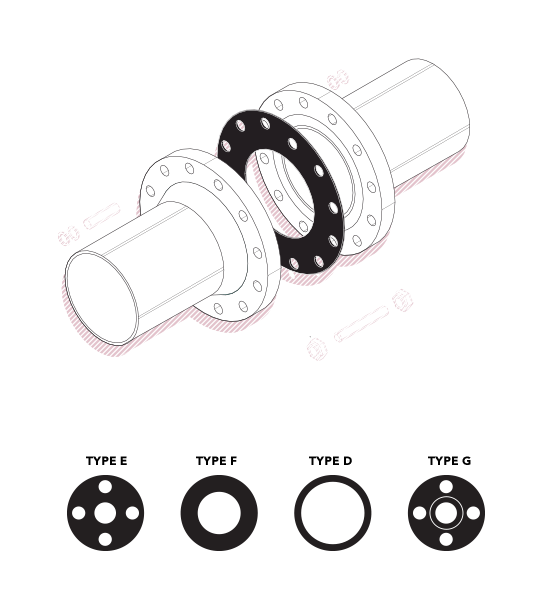 The Flange Insulation is required to avoid leakages due to corrosion. Stray electric currents in the piping system can be controlled and electrolytic corrosion eliminated. Each set will be supplied separately packed and labelled with the flange tagnumber, line size, rating and type. Besides standard sets we manufacture to any required specification.